ST. GEORGE — A U.S. 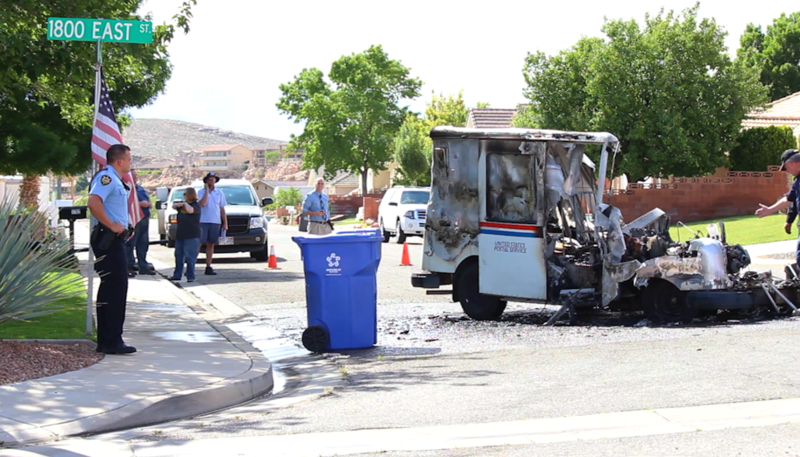 Postal Service mail delivery truck went up in flames Tuesday afternoon at the corner of 2410 South and 1800 East in St. George. At approximately 3:40 p.m., members of the St. George Fire Department responded to the area after receiving reports of a vehicle fire, St. George Fire Deputy Chief Kevin Taylor said. When firefighters arrived, they discovered the mail truck fully engulfed in flames. The Postal Service employee driving the truck was out delivering mail when the vehicle began to have engine issues, Taylor said. The vehicle then caught fire. The man was able to escape the vehicle without any injures. The mail truck still had a load of undelivered mail on board, Taylor said, and much of it was lost. Postal Service employees responded to the scene and retrieved what mail and packages had not been consumed in the fire before the truck was removed from the scene by a tow truck. via KCSG Television – Mail truck destroyed by fire STGnews Videocast Photo Gallery.